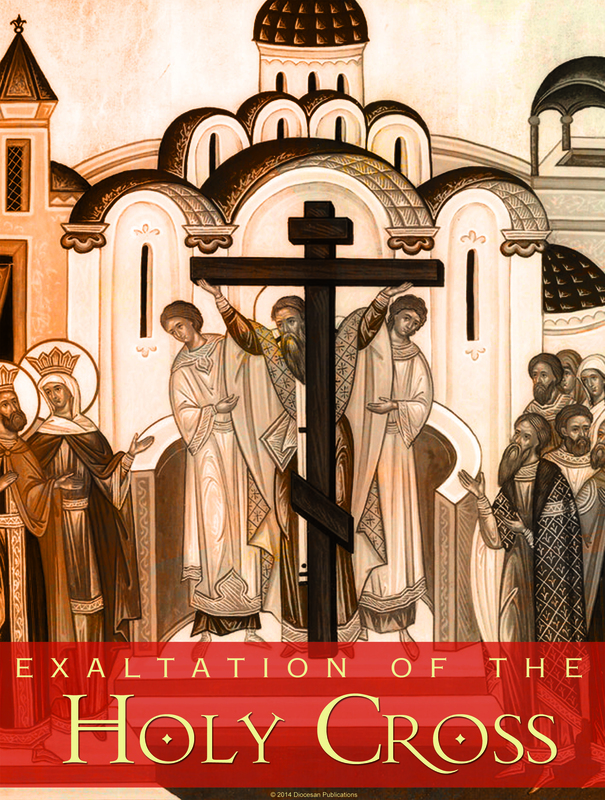 Today we celebrate the cross of our salvation, an ancient tradition of the Catholic Church. It is one of the controversial practices of the Church that makes other churches accuse us of worshipping idols. Exodus 20: 3 says that you should not have any other gods besides me. You shall not carve idol for yourselves in the shape of anything in the sky above or on the earth below or in the waters beneath the earth; you shall not bow dawn before them or worship them. For I the Lord, your God, am jealous. If you read the first part of this statement alone it means to have images of any kind is like having another god. But if you read the complete statement, you will have a different meaning, which is do not bow or worship them. Again, if you read the word ‘’bow or worship’’ you can get more than one meaning. Bowing and worshipping are they the same? To have images is not sin, but to worship them is sin. Bowing to image is not sin, but bowing with the intent of worship as if it is a god is sin. Many of us, if not all, will be guilty because we have different kinds of images, and we sometime adore them because of the love we had for the person who’s image we are keeping. Number 21: 4 God asked Moses to make a bronze serpent so that anybody bitten by the poisonous snake and looks at the bronze serpent might be healed. This would seem like God is contradicting himself here. Do not have images and giving instruction for a bronze serpent/image to be made is contradictory. Worst still, that it be use as an instrument of God’s healing for his people. This explains why selecting passages and interpreting them in isolation of the other parts of the Bible is very misleading and confusing. That is why the Catholic Church encourages her members to seek proper interpretations of the Bible from well informed and certified persons. It is not everyone who calls himself pastor that can interpret the word of God correctly. You must well train to do so. This bronze serpent made by Moses for the people to prevent them from dying of snake poison is a proto-type of Jesus dying on they cross to give us eternal life/salvation. The gospel today talks about it saying, just as Moses lifted up the serpent in the wilderness, so must the son of man be lifted up and whoever believes in him should not perish but have eternal life. The serpent was lifted up on a standard and our Lord Jesus was lifted up on a cross. The cross therefore, is a sign and symbol of salvation. In the cross there is eternal life for whoever would believe. For Jewish, the cross was a symbol of humiliation. For most people today, it is a burden. But that is not true. The cross is a sign humility, love, sacrifice and obedience. The cross is sign of addition which means there is gain in the cross. Furthermore, the cross looks like a ladder which can assist us climb over obstacles in life. Again, it has the resemblance of a sword when place in horizontal position, which means we can use it to fight our enemy, the devil. Lastly, the plane was made in the image of the cross, which means the cross can help us travel to our ultimate destination/heaven. You see how important the cross is? That is why we cherish the cross. John 12:32 Jesus said if he is lifted up he will draw everyone to himself. Lessons-Be proud and appreciate the cross. Accept sufferings in good faith for it is not all evil. Sufferings in prayers, obeying commandments, loving and caring for others are good things to do. Suffering in breaking away from our sins and addictions, child birth, keeping and caring for our marriages, families and friends is wonderful too. Have faith in God and he will assist you to carry your cross with joy and benefits. In Mark 12: 29-31 we are told that the love of God is the first and greatest of all commandments. The second is the love of neighbor. Jesus asked his disciples to love one another as he has loved them (John 15: 12). In our second reading today, St. Paul said that all commandments are summed up in loving your neighbor as yourself, because in doing so you are fulfilling all the commandments of loving God and neighbor. How do we love our neighbor? Last week we talked about carrying our crosses daily as we follow Christ. That is a way of loving our neighbor. Today, we are reflection on another way of loving our neighbor, which is ‘’fraternal correction’’ Love demands that we do everything possible to correct one another. Now, how do you correct your neighbor? Jesus said that you should try doing it yourself alone. If it does not work invite one or two persons to help. If that too did not work, take it to the community of God’s people. And if that person fails to listen to the church too, then he/she should be regarded as a pagan. This goes to tell us that correcting one another is very much our business and duty. But why do people continue to do wrong anyway? Maybe, because they are ignorant, not told that it is wrong to do what they do or not properly approached or felt insulted or humiliated in the process of correction or because of their ego and so on. So, what is the best way to correct your neighbor? A well- known adage says that ‘’you can catch more flies with a spoonful of honey than with vinegar.’’ This means that if you approach your neighbor with love, respect, gentleness and genuine concern, you can more likely win them over than when you approach them without respect and with hate. On the other hand, we should be humble enough to accept corrections when we are wrong. Sometimes when people refuse to correct you it is because of your attitude; you are difficult, hostile, egotistical, and so people are afraid not to hurt you. And when people cannot correct you, you are the loser, because no one is above mistake. When people correct us, they are doing us a favor, showing us love, carrying out their duty of fraternal correction toward us. We refuse correction because of our ego. We think we can do it all by ourselves. The ‘’we’’ is not in our dictionary except the ‘’me’’. Individualism, selfishness, jealousy, and backbiting are common in our world today. Many people want to live alone and do things their own ways. No family or community affiliation is appreciated and accepted by most people. We feel our individual approach to life is the best and would give us happiness. That is wrong. It does not make us happy, but makes us miserable. God created us in his image and likeness. For us to be truly happy, we must keep to the design of God or else we shall forever remain unhappy. The truth is God is community of persons and that is how he created us and wants us to live. It is only when we follow his plan that we can truly become happy in life. To remove God, and refuse his plan for us is a disaster. This attitude of independence from God and others that we crave for today has led to so many miseries in our world today. We see lots of divorces, separations of family members, frustrations, addictions, crimes, and general unhappiness and pain in people’s lives. If we want to excel and be happy in life, we must seek people we respect and love to criticize and evaluate us. We must listen to God and follow his plan for us. I once saw an advert for a Church that said, ‘’Come to our Church and all your problems will vanish.’’ The Church of Christ is not like a commercial product( e.g., pain-killer, house, car, etc.) This is a wrong advert for Christianity. 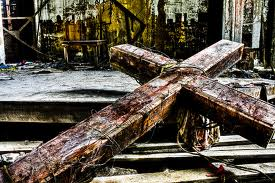 This means that the cross which is a symbol of suffering is part and parcel of the religion of our Lord Jesus. There is no cross-less Christianity. It is not possible be a Christian without carrying the cross. If it were possible Christ would have told us. He prayed that the cup of suffering be taken away from him at the garden of gethsemane, but it was not possible, so he had to carry the cross as the only way to save us. Any Christianity without the cross is fake. Those who preach salvation by faith alone are teaching a cross-less Christianity. Salvation is not by faith alone but by faith and good works. Our faith must be accompanied with good works. This work is the effort you make to leave out your faith as a Christian. And that effort or struggle is the cross you must carry every day and everywhere of your life. No work – no pay. Our crosses as Christians include: prayer, faith, keeping the commandments, love and care for one another in humility, service, obedience, sacrifices and so on. Parents have a responsibility of providing for both physical and spiritual needs of their children. Bringing them to receive the sacraments in the Church is fulfilling their duties. A Sacrament is an outward sign of an inward grace. It is a public manifestation of our conversion, repentance, faith and so on. Some say only adults can do these, but not children. Where is it in the bible? some will ask. We Catholic Christians believe that baptism accomplishes a number of things: Cleans original and personal sin, it gives grace that makes our souls strong, and initiates us into the family of God’s people. So, why should we deny children this wonderful grace? If we, adults need regular spiritual nourishment, why are we refusing children? In John 3:5, Jesus said that no one can enter heaven unless he is ‘’born again’’ of water and the Holy Spirit. Matthew 28:19 says go make disciples of all nations, baptizing them in the name of the father and of the son and of the Holy Spirit. 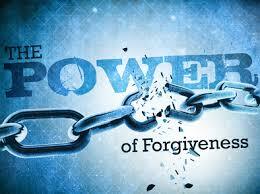 Acts 2:38; 22:16 repent and receive baptism for the forgiveness of your sins. Acts 16: 15; 16: 33 tell how households where baptized, which means if children were there they were also baptized. No indication that baptism is meant for adults only in the bible. In Matthew 19:14, Jesus said that little children should be allowed to come to him for the kingdom of heaven belongs to such as them. Besides, who among you will wait until your child is grown up and able to speak before you provide them food, medical care, education and other needs? We know their needs of worldly and physical things and we provide them. Then why can’t we do the same for their spiritual needs? In areas we want them to develop, we spent time and resources to train them, why can’t we do the same for their spiritual development? 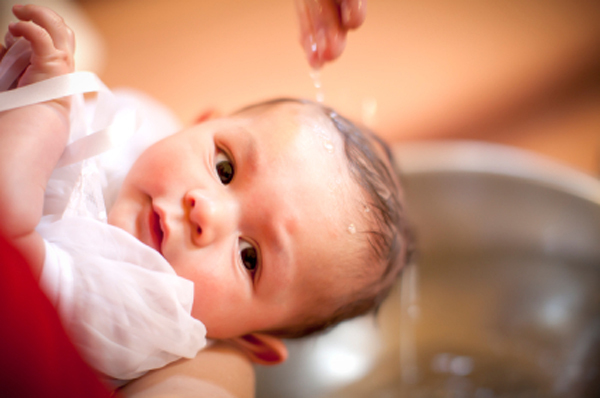 Bringing children for baptism is part of our cross as parents to provide for their needs. No responsible Christian parents will want their children to become pagans or irresponsible citizens. If goat gives birth to a goat, then a Christian should give birth to a Christian. Some may argue that we are imposing our views and ways on the children. That is not true. The children have the right to refuse what was given them as children at adulthood. At confirmation, they have the right to say no to it if they don’t want. It is when they accept and confirm what was given them by their parents that they are to continue to practice the faith as strong members. The Bishop comes to seal their confirmation of the faith they received as children.